Find and compare the best prices from a range of well known car rental companies at Samos Airport. This is a free to use facility, enabeling you to book direct with the company quoting the price. The airport at Samos dates back to the 1960s with the present terminal building having been opened in 2003. Limited bus services exist, transportation being mainly by taxi. 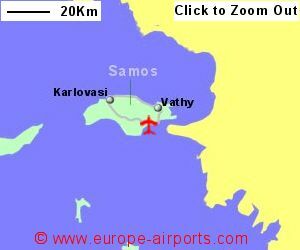 A taxi from the airport to Samos city is likely to cost 25-30 Euros, as would Vathy, just to the north of Samos city. 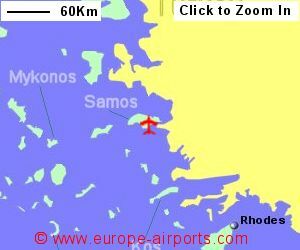 Samos airport has 2 bars/restaurants, a duty free shop, a VIP lounge, and FREE WiFi Internet access. 410,000 passengers passed through Samos airport in 2017, an increase of 13% from the previous year.